This resource features the general description of an underground laboratory. 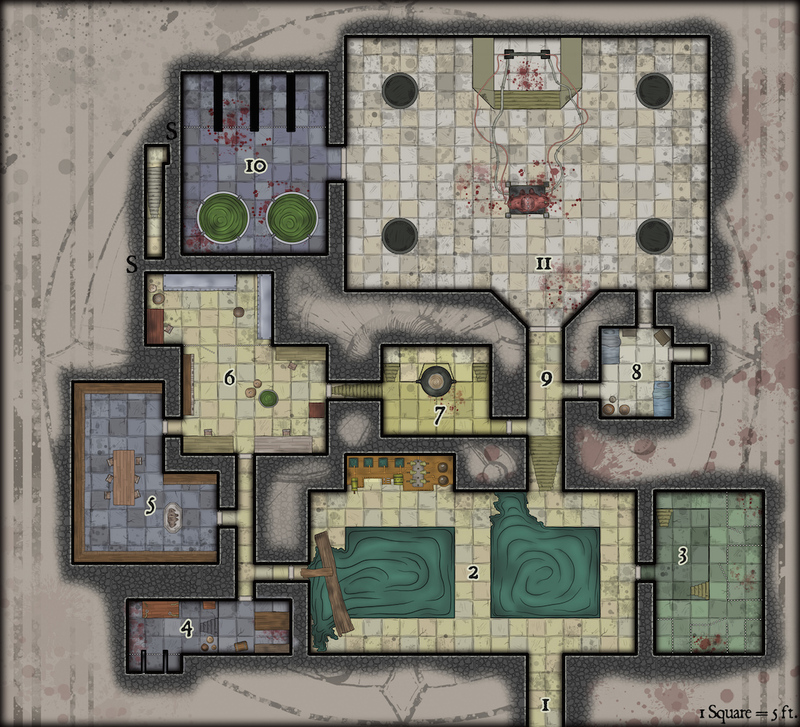 The place belongs to a cultist guild. 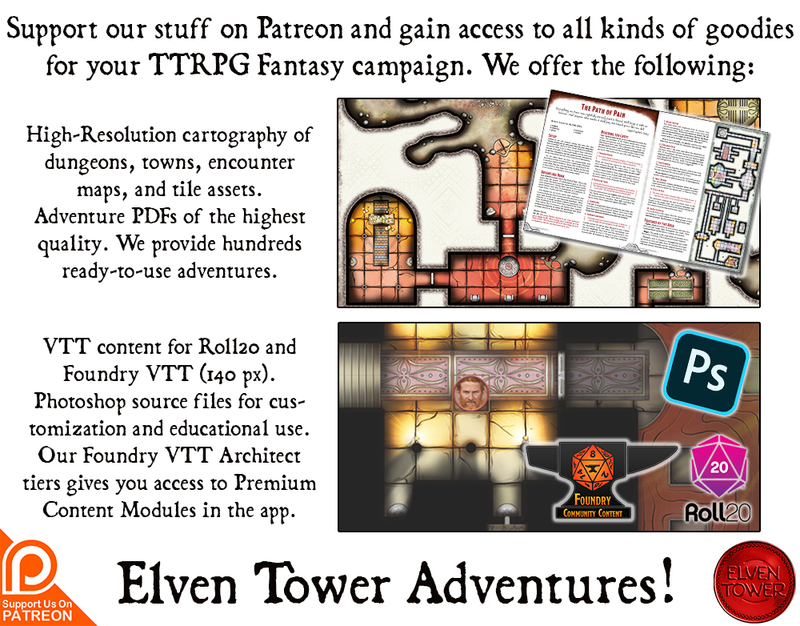 It includes adventure ideas that are appropriate for mid-level (Levels 6 to 10) adventuring parties and is optimized for 7th level parties. Challenge Rating (CR) is calculated using a party of four as the model. The great city of Fardin is in great danger. The growing number of worrying reports have caused an air of distress among the populace. People go missing, people are found dead on the streets, and some people have turned to a strange new religion for support. The head of the new religion is a middle-aged man named Caroll, but people usually only refer to him as the High Preacher. A great number of peasants and common folk gather every day to hear him speak. The High Preacher is an eloquent man. Almost all people who have gone to hear him have returned. The rate of new converts his church gets every week is already a threat to the other churches in town. The call it the Church of Flesh. When observed from the outside, their church and ideology seem to be another variation of so many other belief systems. The Church of Flesh’s main argument is that every living being holds a strength in the fabric of creation. Such strength is located in the very flesh that shapes them. The muscles, so to speak. Blood is also paramount to the system of beliefs in the Church of Flesh. Blood symbolizes the element that binds all together, the connector. That is the apparent purpose of the church. While the church’s arguments are not intrinsically superior to other churches’, it is the High Preacher who is responsible for the religion’s success. High Preacher Caroll manages to convey his ideas in such an elegant way that anyone would think it is the work of magic. There is a dark side to all this, however. High Preacher Caroll is an accomplished wizard and the head of a cultist group who worship flesh and blood. The church is nothing but a façade for a cultist organization devoted to experimenting with living beings and blood. Caroll is naturally good with words, but he enhances his lectures with charm magic. That is how he has managed to lure so many peasants to his church. Below the church is an underground complex where the High Preacher and his lackeys built a laboratory. The place has enough cages to hold fifteen prisoners or more, and they are often full of future experiment subjects. The cult has two ways of getting new test subjects. The first one is to take them directly from their church’s follower base. They lure naïve peasants to the underground complex with a promise of eternal life or a cure for an illness. They are then thrown into a cell to await their “involuntary participation” in a blood experiment. The second way to get test subjects consists of cultist members abducting commonfolk that walk through dark alleys during the night. Sometimes, High Preacher Caroll instructs his cultist to perform bloody murders in the great city. He gives his fanatic followers strict instruction on how the murder is to take place, and the exact location where it must be performed. Caroll does this because he is well versed in rune magic. He is drawing gigantic runes in the city by arranging bloody murders in essential locations. All these actions have troubled the population thus far. The city watch suspects that the Church of Flesh is in some way related to the grim crimes that occur in the city nowadays. But there is no way to demonstrate it yet. Each time a city guard is sent to investigate, he becomes a new convert for that faith. Captain Grumman, the head of the city watch is sure something is amiss in that place but refuses to go after seeing 5 of his men convert to the religion. High Preacher Caroll (Archmage, MM p. 342) is a cruel man who holds no mercy for those who stand in his way. His current goal is to build a small army of Flesh Golems (MM p. 169) and take over the city. He uses the test subjects captive in the underground laboratory to create these golems. To properly treat the test subjects to be used in his golems, Caroll kills them swiftly and then puts the bodies in the great vats in Area 10. 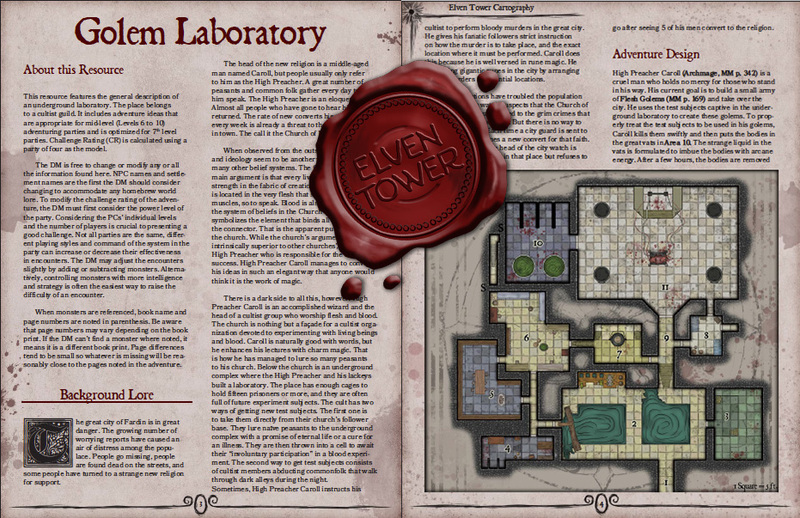 The strange liquid in the vats is formulated to imbue the bodies with arcane energy. After a few hours, the bodies are removed from the vats and taken to Area 4, where Caroll dissects the bodies and choose the best parts. These parts are then grafted to the golem under construction Area 11. Caroll is currently trying to create a new type of flesh golem, one with sentience. The device in Area 11 is supposed to be able to bind the essence of a demon with the golem’s constructed body. If successful, the golem will possess a human-like intelligence while remaining obedient to Caroll. The entrance hallway continues south and connects to one of the church’s basements. The entrance is usually guarded by 2 Cult Fanatics (MM p. 345). These fanatics cannot be parlayed with, their faith in the High Preacher is too strong. This room features a complicated water pump on the north wall. The device pumps fresh water from the two pools to Areas 10 and 11. The water is used for the golem creation device, for refrigeration. The water in the two pools comes from the sewers and smells so. Some of the floor tiles have fallen from water erosion. A few wooden planks were placed a few weeks ago to permit access to the east hall. At any given time, there are 2d4 Cultists (MM p. 345) in this room. There’s a 50% chance that one Flesh Golem (MM p. 169) is on duty here too. High Preacher Caroll is creating terrible monsters by grafting together the body parts of many recently murdered people. High Preacher Caroll is not really a priest. He is a wizard who fooled the entire church’s following into participating in these vile acts. There are a few flesh golems already finished and moving. This room is a grim vision. There is a wooden table with manacles stained with dry blood, three small cells, and surgery and torture instruments laid orderly on top of the tables. There’s a 30% chance that one of Caroll’s top followers is here performing the dissection of a dead person. The cultist is a Mage (MM p. 347) and is accompanied by three Cultists (MM p. 345). This is a library where Caroll and his most accomplished lackeys come to research new spells and techniques used for creating more constructs. The statue in the room is actually a Flesh Golem (MM p. 169) with an illusion spell that makes it look like a normal stone statue. It appears to be the statue of the High Preacher himself. The DM is free to determine whether an important volume is currently in the collection here. Arcane volumes that describe the process or creating flesh golems or binding demons to the material plane are particularly dangerous in the wrong hands. This room is not used often for researching, although it is its primary purpose. It is used more frequently as a dining hall. There are however several desks and cabinets with old research papers and scrolls. The room is cut in half by metal bars. The most important research documents of the High Preacher are stored in the cabinets near the north wall. The barred door is usually open. There are 2d6 Cultists (MM p. 345) in this room at any given time. They are aware of approaching enemies if a fight with the Golem in Area 5 occurred. This room features an enormous cauldron that’s only accessible through the elevated section on the north part of the room. The High Preacher use this cauldron to brew the arcane liquids used in the vats in Area 10. This small room features living quarters for two people. The High Preacher usually returns to his residence in the city every day, but his loyal followers in charge of the cult when he is not there sleep here. The hallway that leads to Area 11 is protected with fire jet traps. They are triggered by stepping on pressure plates on the floor. Once a plate is pressed, multiple jets of fire engulf the room in an instant. Any creature standing at least 20 feet from the double doors to Area 11 is affected. Each affected creature must make a DC 16 Dexterity saving throw or take 30 (10d6) fire damage. Or half as much damage on a successful save. An adventurer can detect the pressure plates with a passive Wisdom (Perception) score of 14 or higher. Or a DC 14 Wisdom (Investigation) check. This room features two big vats filled with a green tinted liquid. The vats are10 feet high. The room has a sour smell to it. The north wall features 4 cells. There are 2d4 prisoners still alive in the cells. They may reveal the same information as the prisoners in Area 3. There is1 Flesh Golem (MM p. 169) and 1 Cult Fanatic (MM p. 345) guarding this room. This is the biggest chamber in the underground complex. The roof is 40 feet high and supported by four sturdy stone pillars. There is a flesh golem with tubes of strange colored liquids connected to it in the middle of the room. The golem is finished but not “alive”. The High Preacher Caroll (Archmage, MM p. 342) is in the room currently finishing the binding ritual. As he mutters the last words of the incantation, the golem starts moving and follow his commands. The sentient Flesh Golem (MM p. 169) is equal to the others but intelligent. There are also two Cultists (MM p. 345) and one remaining Cult Fanatic (MM p. 345) in the room ready to give their lives to defend their religious leader.